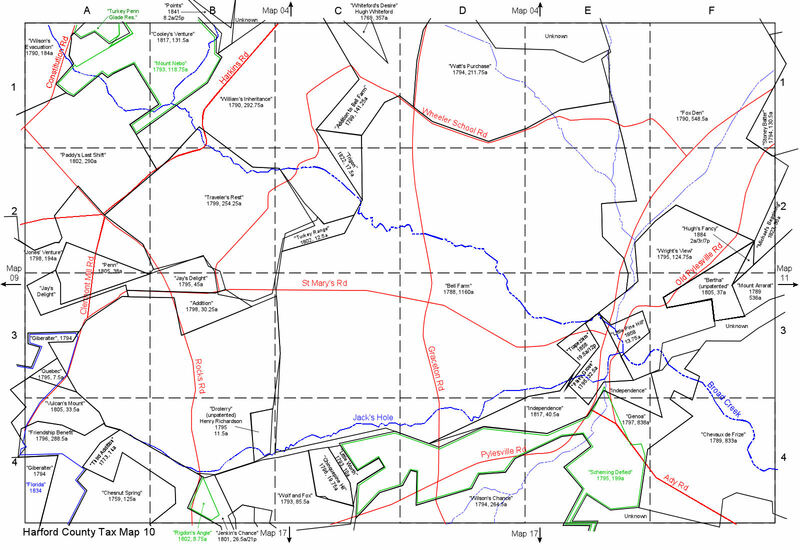 The data contained in this section is derived from numerous sources in order to plot the location of the early land grants in the present day Harford County. 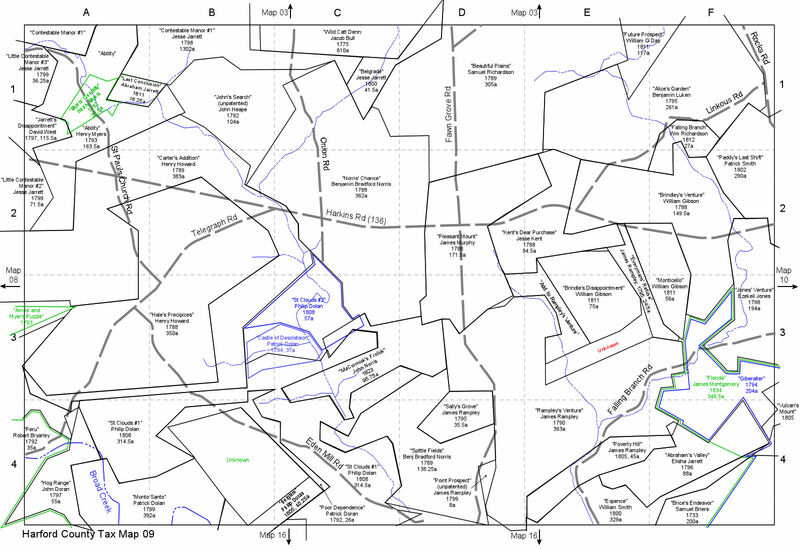 Since many surveys start at a landmark no more explicit than a "White Oak" or a stone, one can rarely determine the location of a tract just by looking at its survey. It's similar to a piece of a jigsaw puzzle which is only meaningful when one can fit it with its adjoining pieces. Occasionally, a survey references the Bay, a branch or run, or an old road which remains today, slowly allowing the assembled pieces to be placed on the map. The main assistance in correctly placing parcels comes from the present day "Tax Maps" for the county, which show all the current properties with enough accuracy, although there are errors, to indicate the extact location of many tracts. Even though there have been many changes in property lines over time, there still remain many boundaries from the 17th century. The data presented is part of an on-going project to locate some additional records and to better position tracts which do not fit well with their neighbors. This includes determining where the mistakes were in the original survey. This data allows one to determine the exact location of a property owned by their ancestors. In some cases, a house may still be standing. In other cases, knowing the location may help to determine identities of spouses who were often from nearby families. Being on the Chesapeake Bay, the developement of the County began along the shore, with many early parcels being defined as some distance "for breath" along the shore and going back into the woods "for length", sometimes a mile. The second phase of development followed the rivers and streams as people discovered the valuable water resource formed by the "fall line". As settlers wanted more space, the granting of leases and then patents moved into the central part of the county. During the 1740's and 1750's, the northwest portion was mainly leases from "the lands reserved for his lordship's use". Only after the American Revolution was the northwest portion of the county granted for ownership. The following describes the fields used in the table of patents. The date the patent was granted or survey was made, given in old style until 1752 (e.g., 1 January through 24 March 1687 is really 1688). Given in acres and perches, as stated in the survey, not always accurate. Area as it plots in DeedMapper. Some patents were surveyed for someone different from whom they were eventually granted to. This was often a parent who died before getting a patent. The heirs then had to get the patent to prove ownership before they could sell it. Thus, these types of records often give information about relationhips and deaths. Pat Cert - Patented Certificates, both Baltimore and Harford Counties, beginning about 1710 for Baltimore and 1772 for Harford. These are original copies of the certificates of survey submitted to the land office and retained to this day in the Archives. They contain the verbal description of the metes and bounds, a drawn plat, and often a description of what was on the land. Many also contain specific genealogical information. They are all online at Baltimore and Harford. Unpat Cert - Unpatented Certificates, both Baltimore and Harford Counties, similar to Patented Certificate. Many were simply leases and others just did not complete the Patent process. They are all online at Baltimore and Harford. Patent - Patents, from the Patent books, 1657 to about 1720. These were originally copied into books from the submitted certificates of survey and the books were transcribed one or more times as they wore out, thus, mistakes have been introduced. Click for list of Patent Books. Surveys - copied from Henry Archer's copies of early surveyors' books. These are available at the Archives under CM1243. 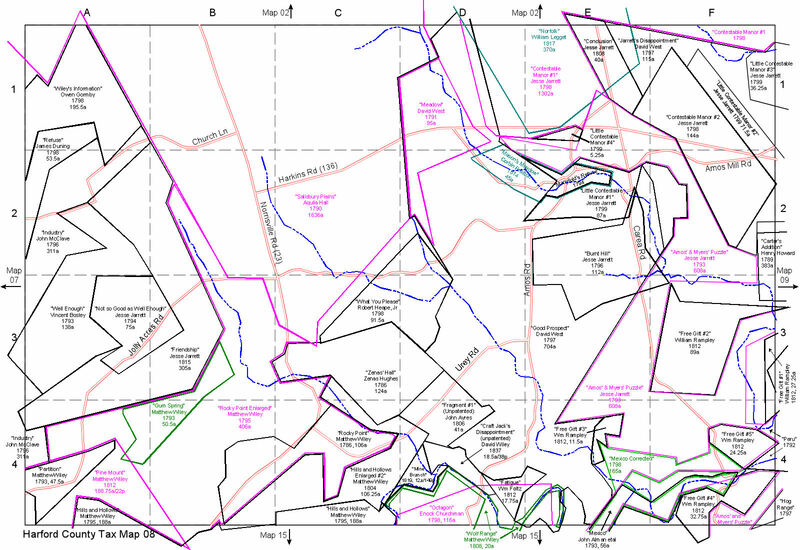 Unknown - no patent or certificate has been found, but plot or tract derived from surrounding tracts. Patented Certificatse - Numbers of the format HA-P:### or BA-P:### are patented certificate for the two counties. Unpatented Certificates - Numbers of the format HA-U:### or BA-U:### are unpatented certificate for the two counties. Patents - Numbers of formats such as 11:### and PL#4:### are patent books, giving the Book designation and folio (page). Items in parentheses are the book/page that something was transcribed from if indicated in the transcription. Archer's copies - These use Henry Archer's designation for his books: TW for those copied from Thomas White's survey books from the early 18th century, DS for those from Daniel Scott's field books, DC for David and William Clark's, PD for Patrick Doran's, and HA for Henry Archer's own from various sources. Many of these are not accurate. Note that Tax Map numbers with letters (e.g. 70B) do not actually exist in the County's record since they are a part of Aberdeen Proving Grounds. These numbers are assigned only for the purpose of this index. Click here for a map of the location of the taxmaps in Harford County. The County's data should be referenced for more accurate locations of each tax map. As maps are produced, copies with be placed here (about half MB each). If you have any comments, suggestions, or questions about the exact location of any patent, please send me an e-mail.